Go somewhere on campus and write a story about what you see there, said my teacher. For some reason my feet carry me back to where I was, nervous and fueled by a lack of sleep and a fear of failure, not thirty minutes before. The senior studio in the fashion department is pretty unimpressive as I walk in. The place looks as if abandoned- empty coffee cups and water bottles are strewn across the tables in an endless dance with the scraps of muslin and thread that are our steadfast co-inhabitants in this place. The tables are out of place, pushed aside in order to make room for our presentation “stage,” surrounded on opposing sides by dress forms and five foot tall inspiration boards. My frazzled reflection stares back at me from the black windows on the opposite wall. I hear voices of sophomores working toward their deadlines in the other room, their voices accompanied by the clicking of the sewing machines and Christmas music lilting in from down the hall. Footsteps approach me and two of my classmates appear. Abby Taylor and Deanna Proske are both senior design majors. They just got back from the Donnelly café, which they refer to as Don Caf, where they had shoveled down dinner after sitting through their end-of-the-semester critiques. Their general air is something like a balloon whose air had just been slowly let out after almost reaching its breaking point. “ My sleeping cycle is gonna be really off,” says Taylor, who plans on going home to sleep and then go out for one of our fellow senior design major’s birthday- which happened to fall on critiques. 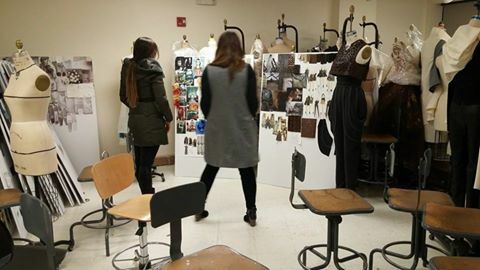 During a critique, designers stand in front of the class and present their concept, samples, and finished garments to classmates, faculty and fashion show production staff. Often, the workload for these critiques require several consecutive sleepless nights leading up to the deadline as well as late nights in the weeks before. The designers pulled out their boards for a quick photo op and reflected on their individual critiques, and how the rest of the year will go for them. “You feel done after a critique, but you can’t see the light at the end of the tunnel,” said Proske. Designers go through three capping courses, two in the fall semester and one in the spring. “It’s the never-ending year of work,” said Taylor.